"how to keep getting the most out of your premium binocular"
Anyone who walks out of Company Seven's showroom with their new telescope or binocular will often hear someone murmur "he'll be back, they all come back". This is because the main gizmo may just be the base price of admission to our universal hobby, but it will be the accessories or necessities, that will dictate what the person can see or do (and where) with the binocular or telescope. So sooner or later they will be back to buy this or that, but unfortunately we occasionally receive binoculars for repair that are in dire need of service - and for some of these the visit came too late. Here we will help you to understand what can impact (no pun inteneded) a binocular, how to assess that, and what to do if it happens to your binocular. It is always best to protect a binocular by exercising care and common sense, this can avoid most problems mentioned below. 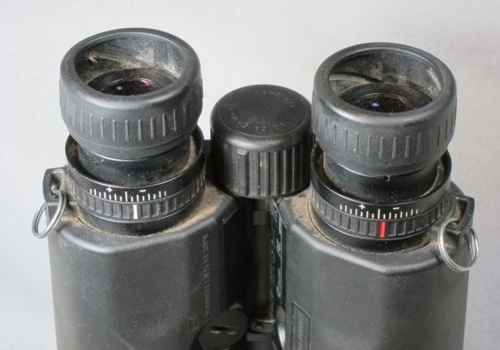 But there will come a time when the binocular should be professionally serviced; these are made up of dozens of parts many of which may have seals or lubricants that should periodically be renewed or replaced. Just as one would not drive a car for ten years without some preventive maintenance, it is best to care for binoculars before some of the insidious problems develop. There is no particular recommended service interval for binoculars that show no obvious signs of problems because the interval depends on many variables. But I think a typical amateur birder for example, one who is a "fair weather" observer staying close to a home without environmental extremes, should think about having service every 15 or 20 years. People who put hard wear and tear on a binocular (shock and immersion while kayaking, mountain climbing activities, use in desert areas or along beaches that exposes the binocular to sand or fine dust, etc.) should inspect the binocular more often, and probably consider sending them in for service at more frequent intervals. but it will also be able to better resist shock, vibration, and the elements. Parts availability for service or repair may be an issue too. Most makers of less costly binoculars offer no parts or service, they sell what we at Company Seven refer to as "disposable binoculars"; we refuse to sell a binocular that can not be serviced. While other makers (Leica, and Carl Zeiss for example) may provide parts for binoculars that might be several decades old; this means we can usually repair or refurbish a binocular, to working much as it was when new, that might have been used by your grandparents! Considering parts availability, even if you have a healthy binocular, you might do well to have it serviced before parts for it become obsolete since that will buy more decades of good use. time where parts and seals can wear permitting mildew to form. 1. Impact can happen not only when a binocular is dropped. It is not uncommon to see binocular arrive here for service from an owner who swears he never dropped it, well maybe someone else did? Or maybe someone put the binocular in a backpack or purse that was then struck against something else? Signs and symptoms of mechanical impact tend to be apparent: the binocular presents a "double image" (collimation or alignment of prisms shifted) or blurred views, focus or diopter controls become sluggish; either turns but not with uniform effort, retractable components (eyecup sleeves, etc.) tend to be hard to extend or retract if not bound up for example, hinge tension feels inconsistent throughout the span of interpupilary settings, etc. Images simulate normal and collimation problem views. 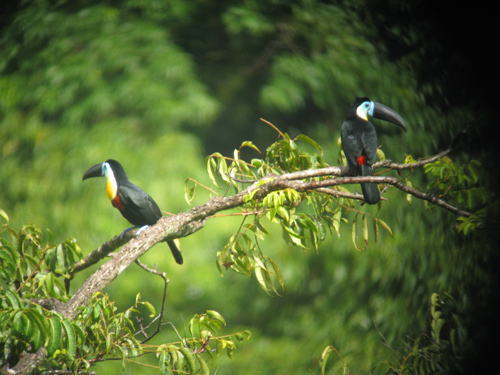 Above Left: image of Toucans in Trinidad as should appear in a well collimated binocular. Above Right: double image as may appear in a binocular that has be jostled out of collimation. The user should pay special attention once in a while to sensing how the controls of the binocular feel. Look for signs of dings or dents, or bends of the barrels; the two sides of a binocular should basically appear to mirror each other. After any serious drop or shock look for signs of breakage by feeling all the controls, then hold the binocular up about one or two feet away from your eyes and look through the large (objective) end while pointing the smaller end (eyepieces) towards a white light or to outdoors. 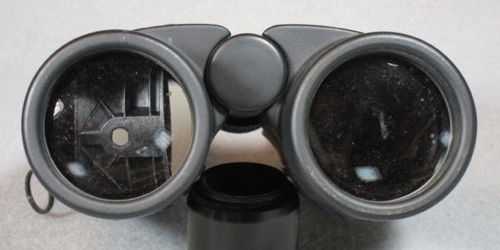 The optics inside the binocular should appear identical left and right, and should be crystal clear. Seeing any loose parts, chips or cracks in the elements, discoloration of areas of a lens (can be a sign that a cemented lens is separating), are signs of problems that need prompt remedy. Images of binoculars sent to Company Seven for cleaning and repair of collimation. Above Left: Impact bent front left barrel lens cell and retaining ring. Above Right: Impact at top of left barrel front end bent lens cell and caused lenses to separate; note the rainbow colored discoloration. Below Left: Impact to outside of right barrel shattered the prism; radial pattern points to site of impact. Below Right: Impact caused internal components to break free in right and left barrels. 2. Extremes of environment: manifest the problems in several ways. For example in extreme cold climates this cold can cause lubricants to become less viscous, almost like glue, and this can feel like a tightening or binding of controls and hinge tension. This usually resolves after the binocular is moved to a warmer area. For binoculars that will see extended service in extreme climates we provide optional treatments; these should be serviced again for use in "normal" climates (from about 20° to 120 degrees F). Images of binoculars sent to Company Seven for cleaning and refurbishment. 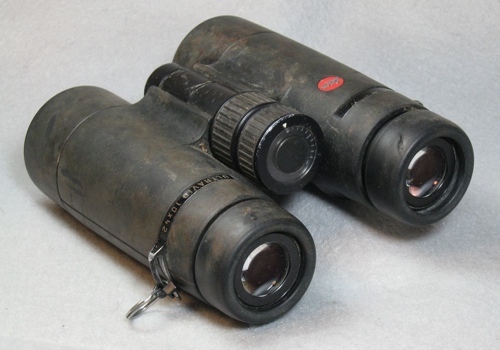 Above Left: immersed binocular right barrel and objective lens fogged and penetrated by mud and water, left barrel penetrated by water to lesser degree. this might dry out somewhat over time but corrosion and possible development of mildew inside would progress. 3. Sand or grit contamination: using a binocular in areas with blowing sand (desert, seashore, etc.) or other contaminants (salt air) is more likely to allow very fine particles to migrate into threaded areas or moving components of a binocular. It is best to either buy a better sealed Individual Focus binocular for use in these environments (these may be wiped down with a damp sponge or rinsed off under clean running water), or pay special attention to protecting the focus and other moving controls of Central Focus binocular when not in actual use. Keeping a binocular in a closing flap or zippered pouch can be a big help in harsh environments. Above: binoculars encrusted with dirt, blood, and other contaminants but overhauled and returned to service by us. 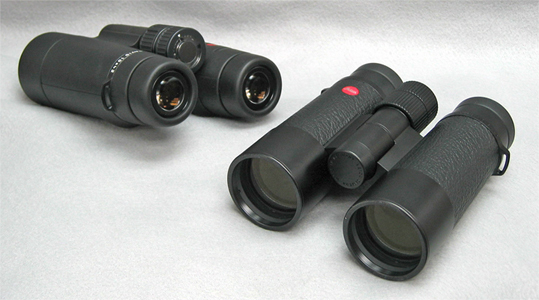 Many of the common mishaps, finger prints or a drink spilled on the binocular for example, can be cleaned by the binocular owner with simple techniques and readily available cleaning supplies. You can refer to Company Seven's article "Cleaning Telescopes And Most Consumer Optics" to read a short illustrated "how to" about how to clean lenses and mirrors. This article includes a decision tree "flow-chart" with discussion of particle removing techniques, brushes, and solvents. 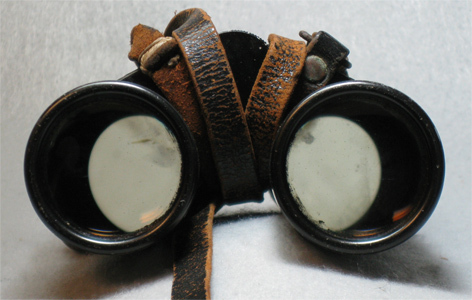 Seeking professional cleaning promptly after exposure to sand and grit in particular can moderate the costs and keep the binocular in "good health". The owner should periodically stop and pay attention to the feel of the controls for signs of sluggishness or grit contamination. Look over the entire binocular for signs of corrosion, for dirt building up, especially near the focus/diopter controls, and along the hinge. 4. Time: the seals and lubricants of the system will dry or rot, this may take years or even decades, but in time this normal process allows the nitrogen inside to escape and exchange with moisture laden air. The humidity will condense on the interior optics causing a progressive fogging over time. The problems tend to develop more quickly in areas with high humidity over long periods (Amazon, Panama, parts of Florida, Carolinas, Hawaii, etc. ), and this can promote the fogging of the interior optics. 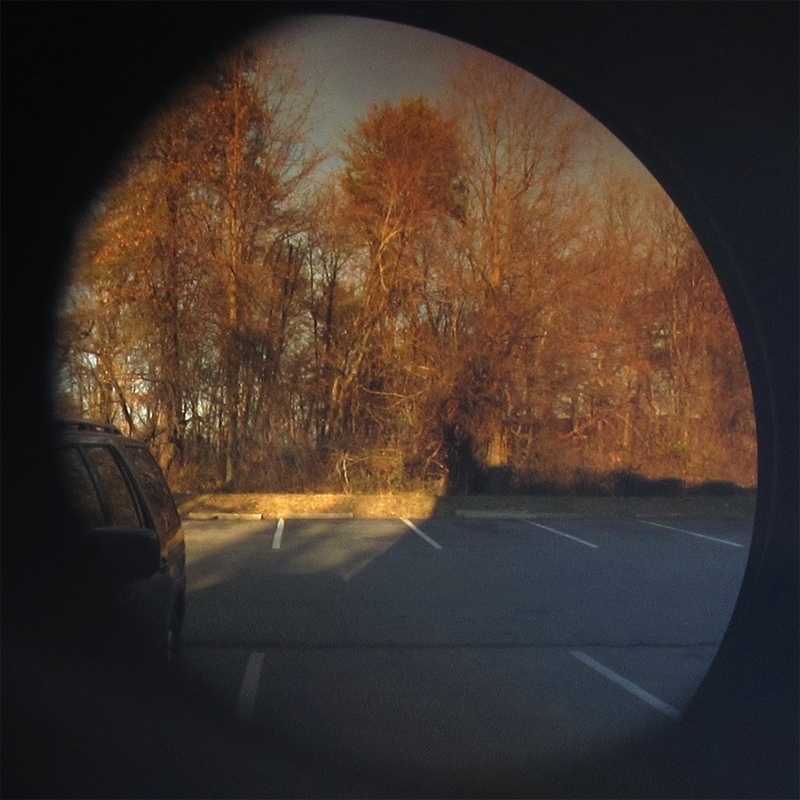 This shows up at first as a simple loss of contrast, since this happens over time it is hard for the average person to tell unless they compare the views through the older binocular with that of a new binocular. Storing a damp binocular in a case or pouch makes the problems even more likely to develop, so we suggest letting optics dry in a controlled air conditioned climate prior to packing them away for extended periods. One way to look for signs of internal contamination is to hold the binocular up about one or two feet away from your eyes. Look through the large (objective) end while pointing the smaller end (eyepieces) towards a white light or to outdoors. 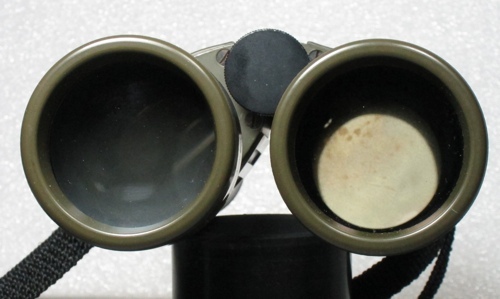 The optics inside the binocular should appear identical left and right, and should be crystal clear. Any signs of spots, hazing, white or black specs, etc. are signs of contamination. Fungus can develop over time, appearing like a haze it may be hard to distinguish from fogging at first glance. 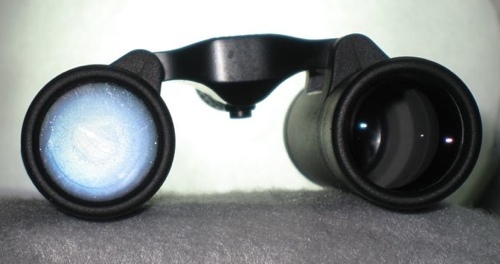 If the optics (binocular main optical system or its other components or oculars) show a light haze then this may be just a surface coating from humidity or it may be fungal in origin. If fungal then it is very important that they be serviced soon. It may be that the contaminants may be cleaned and the spores neutralized with modest expense of time and materials. If the glass is etched then it is likely that it is not practical or cost effective to regrind, polish and figure the optics; we would simply replace the optic(s) component. Top Left: binocular right barrel and objective lens fogged, left objective clear but prism mildewed. Top Right: binocular prisms have mold, though the objectives are clear. 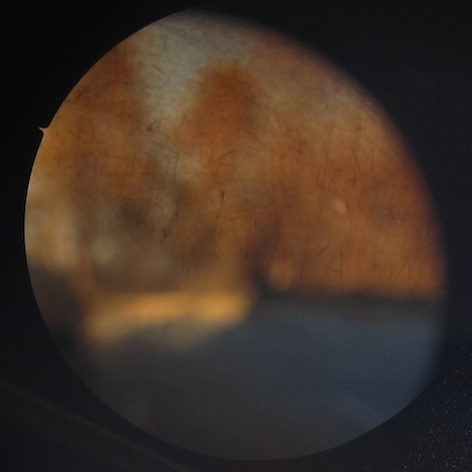 Above Left: looking out through the objective (large) end of a binocular barrel the image seems not consistently sharp across the field of view. 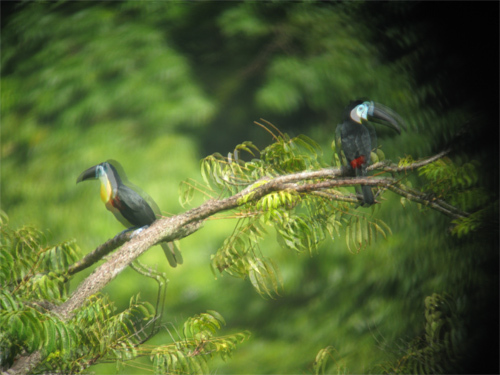 Above Right: focusing the hand-held camera on the binocular prism reveals the lines and fogging that prove the prism surface has mildewed. When in the field but not using the binocular over some time, then keep the Rain Guard over the eyepieces. Also snap the front caps over and onto the front objective lenses of the binocular. When not in use keep the binocular stored in a protective case, ideally a hard-shell case or heavy duty padded soft case. Never pack away a wet binocular in a closed space over any extended time, and avoid keeping any optical item in a damp room or basement. If you will expose the binocular to extreme conditions at sea then we recommend you select an individual focus binocular, one that is designed with this work in mind. This may be one of the several Fujinon models, or the Carl Zeiss 7x 50B GA/T* marine glass for example. Attach the carrying strap to the binocular, and use the strap (around your neck, over a shoulder, etc.) to reduce risk of dropping the binocular. When operating along a shore line or from a boat, then attach a floation-style Carrying Strap with enough buoyancy to keep the binocular from sinking if dropped into the water. 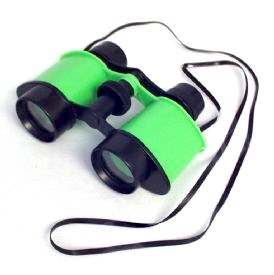 If you share the binocular with an inexperienced user, then hand the binocular, strap first, to the other person. Ideally, help them fit the strap around their neck to minimize the chances of them dropping the binocular. Never climb a tree or other obstacle while wearing a dangling binocular. 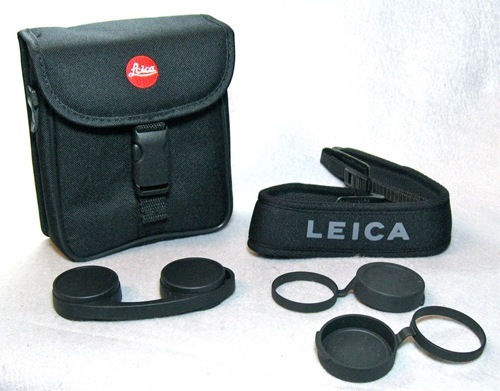 Secure the binocular into its pouch or case, or in a holster, or in an empty coat pocket. Maintain a comprehensive home owners insurance or a separate policy that reimburses loss of costly goods that you travel with*. If you bought your binocular new fill out and mail in the Owner's Registration Card. This may provide no fault coverage against accidental damage, or may entitle you to discounted service or repairs in the future. 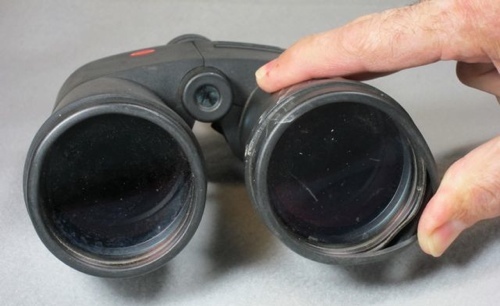 Avoid buying Gray Market (items meant to be sold outside your country of residence), refurbished or dealer demo products since these are not likely to bear the conventional new binocular warranty. 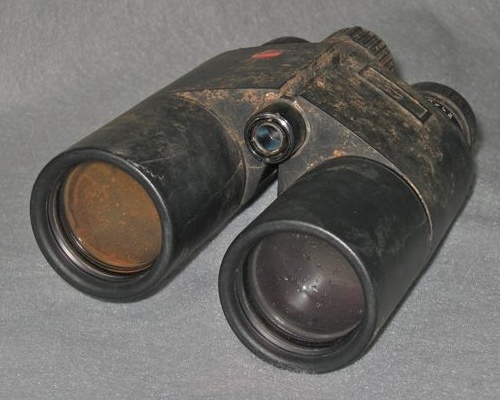 Often these binoculars may sell for somewhat less than a new binocular, but the lack of a regular US-issued warranty protection and lack of good will consideration that might otherwise be expected from the US based representative of the product, may cost you far more in the future. Think twice about loaning your expensive binocular to inexperienced or immature users, especially to those who cannot afford to replace them! * you may refer to our article "Insurance for Telescopes, Accessories and Observatories". This article explaine the various insurance vehicles available to the consumer, advice on traveling and transporting telescopes, and advice about when and how to file a claim. This article includes a glossary of insurance terms. While this specifically addresses telescopes, the principles are applicable to premium binoculars too. Incidentally, we have never before seen an article on this subject researched and published elsewhere. Hope this helps keep your binoculars healthy for the next generation of user! My Binocular Needs Help - Now What? Immediately after any severe impact or if you notice any change in the feel of the binocular (grit in the eyecup sleeves, loosening of the bridge hinge, rotation of the focus controls, any 'blurring' or 'double image') then you should consult Company Seven about the best remedy sooner rather than later. 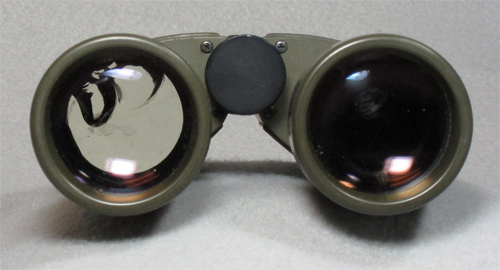 Some concerns may not even call for a return visit, for instance we have spoken with people who acquired a used binocular and simply did not know there is a diopter adjustment that had set for the previous owners preference; without turning this control the new user might be left thinking something is wrong with their binocular. You may obtain a Return Authorization to return your binocular for evaluation, service or repair. During the service visit we can replace worn or missing accessories (eyecups, strap, protective rainguard, pouch or case, etc. 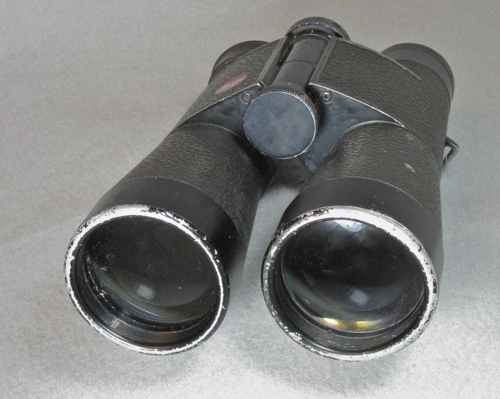 ), even replace the worn rubber armor covering of the binocular so that it returns not only showing great views and focusing as smoothly as new, but also looking much better. So there is hope that our new or factory reconditioned parts with competent servicing can restore almost any tragic presentation into a nearly miraculous resurrection. After we receive this requested information then the RA Number with instructions on how to pack, and where to send to will in turn be provided to you.